“WOW! Our portraits are absolutely GORGEOUS!!! I am so glad that you were able to capture those special moments for us. Depending on the lighting and time of day different colors just pop out of that portrait. will be your “children” even when they’re married and have kids of their own) are growing up, and becoming more like adults every day. Don’t you wish you could just “freeze time” and hold these special moments forever? My name is Tim Allen, and capturing wonderful family memories is what I’ve devoted my life to. I’m a professional family photographer, but more than that, I’m just like you… I’m a family person. Can you relate to this at all? I wake up every morning and wonder where the time is going. Do you ever do that? Have you noticed that, the older you and your children get, the faster time seems to fly? I feel so very lucky – I spend my life capturing memories – FREEZING TIME – and that is a real gift for me. I can’t imagine anything in the world I would rather be doing. What Wouldn’t We Give To Be Able To Hold On To Our Most Cherished Memories FOREVER? That’s one of the reasons I became a professional photographer – I want to help other families hold on to their family memories forever, and never regret not having a family portrait done. So many families put off having a family portrait created, saying “I’ll have lots of time,” but time just keeps ticking away. We need to capture THIS TIME, now, and never let it become a distant memory. If you’re at all like most of the families on this website, you probably haven’t given a lot of thought to having a family portrait created. Don’t worry – that’s pretty normal. You’ve got a lot of things going on in your life. Life is busier and crazier than ever these days, and family life in particular seems to be happening at an ever-accelerating pace. Tim and Luda are exceptional people and his work as a photographer is superior and along with his humor helped us to make a “once in a lifetime” family portrait. We would highly recommend him to anyone. Once again, thank you for a superb experience and gorgeous portrait. I will say again, the portraits are amazing, and I still have tears. Thank you, thank you, thank you Tim!! Most people, when traveling somewhere on vacation, never think of something like this. 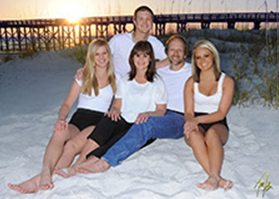 You’re going to be here – in Florida – on vacation, having a wonderful family time with you and your loved ones, so why not have a PROFESSIONAL family portrait created while you’re here? Can you think of a more happy, fun, and relaxed time for your family? Isn’t that how you really want to have your family captured in a masterful portrayal you will always love? There are SO many reasons to seriously think about this. First of all, as I already mentioned (and as the clients whose photographs are displayed on this webpage also refer to), these photographs will become priceless mementos of your family’s love. 1. Most photographers cram in as many sessions as they can, shooting with the wrong light at the wrong time of day. Unlike other photographers, we do only one session a day taking the time to get wonderful portraits on the beach with that magical afternoon sunlight all the way through the sunset. Having lots of time allows for a relaxed and fun setting where we can create the family portrait as well as various groupings and some spontaneous candids. We are not a “COOKIE CUTTER” type of studio. The time is yours and we will create what you want. 2. I pride myself in having the ability to capture relationships on film, and this is due to my sincere love of families and kids and pets (they are part of the family too). As you look through more of this website, you’ll see exactly what I mean. 3. Technically, the beach with white sand is extremely difficult to properly light, even for experienced photographers. I have often had families come to me after first having brought down their own family photographer from places such as Atlanta only to be disappointed in the results of their photographer often due to lighting and dealing with kids on beach. 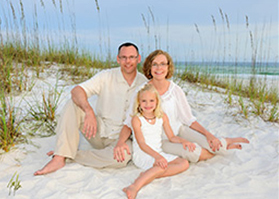 I specialize in the beach, and I love it with over 30 years of experience here. 4. I know the beach EXTREMELY WELL. 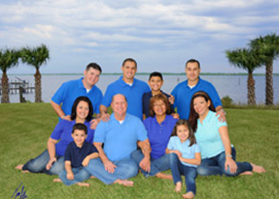 In fact, I was actually able to produce a beautiful portrait of a family only a few days after a major hurricane. You would never know the beach was torn up as I found the right spot – AND THE RIGHT LIGHTING. It’s truly an art-form, and this should not be trusted to just anyone. 5. ADDITIONAL ENHANCEMENTS – We have an incredible artist, one of the finest in the world, who knows the beach and colors so well that we can bring out every beautiful aspect of the beach and eliminate the distractions. Our clients cannot believe the difference in the first image they see compared to the final with artwork rivaling a masters painting. IN FACT, we have literally had clients so excited when they saw the final that they jumped up and down for joy! No kidding! price as portraits created in the studio. Here’s what I strongly recommend you do IMMEDIATELY! Our dates are booking fast as we do work with just one family a day! Pick up the phone and call me right now, so we can chat a little about your family, and what you’re looking for in a beach photograph. There’s NO COST, and absolutely NO OBLIGATION for that chat. Or, if you’d rather, simply send me an EMAIL, and I’ll get back to you right away. However, the best option is to chat on the phone, as that’s when you’ll really get to know me, and you can ask any questions that might come up during the conversation. “The portraits are absolutely wonderful!! We can’t thank you and your wife enough. The family photo will be such an asset to the house. It was a great pleasure working with you and your wife. Thanks again!!! SIMPLY CLICK HERE for the phone number or email address to my studio. I have another page in this website dedicated to the magic of Family Portraiture – you may want to take a look at that. Simply CLICK HERE, and I’ll tell you all about it. Don’t wait to act on this. Time is moving much faster than you think. Be sure to take hold of the moments that matter the most, and allow me to create a portrait of your family you’ll never forget. PS. STILL NOT READY TO CALL? That’s okay. I can still give you some more secrets FOR FREE in the mail. If you’d like more information about family photography rushed to your mailbox, simply CLICK HERE to have more secrets rushed to you.